them. 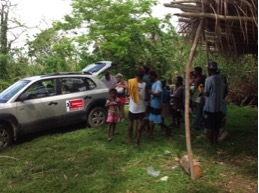 Through the help of Rotary Waitakere we managed to get them up to Vanuatu. This week we found out and saw just how they had been used. 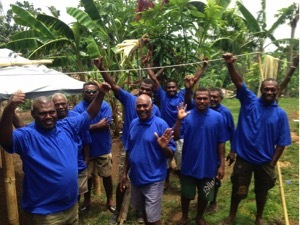 The t-shirts have been used to support groups of locals in dire need of clothing especially to those in remote islands after the cyclone; some have been used by international doctors and an incentive for locals to get their health checked; some have been used by volunteers working on the recovery after the cyclone. And its largely thanks to the Waitakere Rotary club and an amazing local Motel hostess working at the Vanuatu end. So thanks very much large corporate for thinking outside the box and getting in contact, thanks very much to Rotary Waitakere and Rotary Port Vila, and thanks very much Janelle the fantastic motel hostess. Great work!! 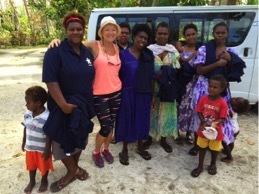 This entry was posted in Uncategorized and tagged hands, my, rotary, t-shirts, take, vanuatu. Bookmark the permalink.